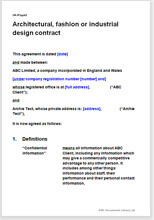 This is a straight forward contract for any design work in any industry. It is written for the client to initiate and stay in control. It is intended to make sure you, the client, get what you have paid for. It provides for an assignment to you of all created work. The person you use is an individual who is a design expert (you hope!) in his field. He is self employed. Your designer will work on or off your premises. He may used staff besides himself. You may want to use the designer more than once (this is an “umbrella” agreement). Your designer may not be in your country.